Small Kitchen Ideas – One of major problems that people often experience with their small house is the lack of space they have for kitchen. 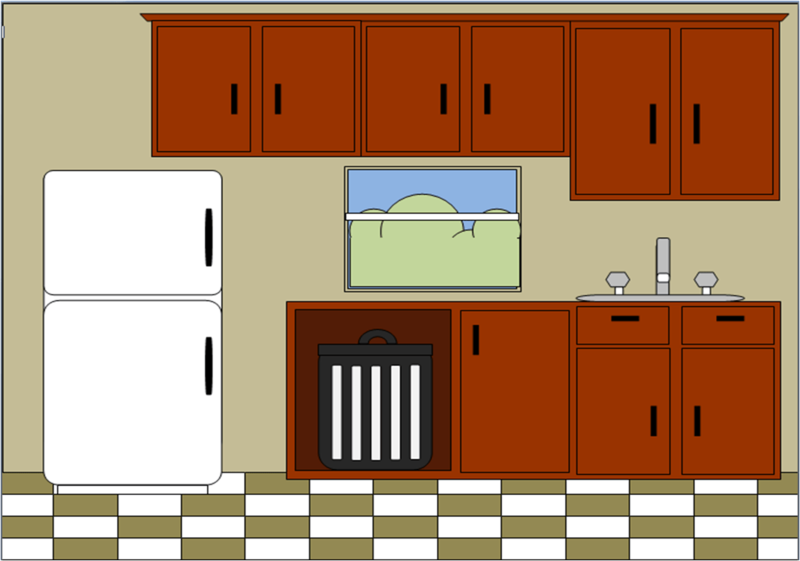 They don’t have enough space to put various kitchen appliances and utensils that they need for cooking. brighter. 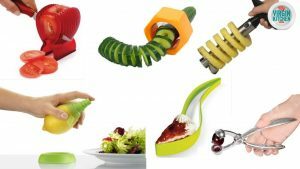 In the end, their kitchen looks gloom and unattractive, which can kill the mood when they cook their food. 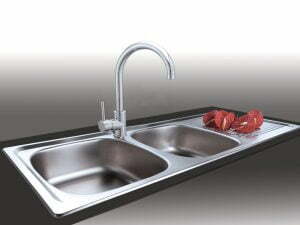 Interesting isn’t it, kitchen space can cause this much problems? However, it doesn’t mean you can’t solve it. Every problem was existed with its solution. 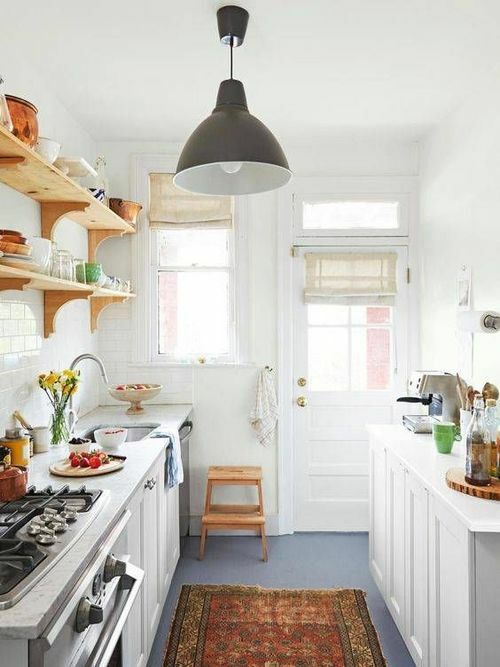 And, for your small size kitchen, there are many ideas and references you can use to change it into better and beautiful kitchen. 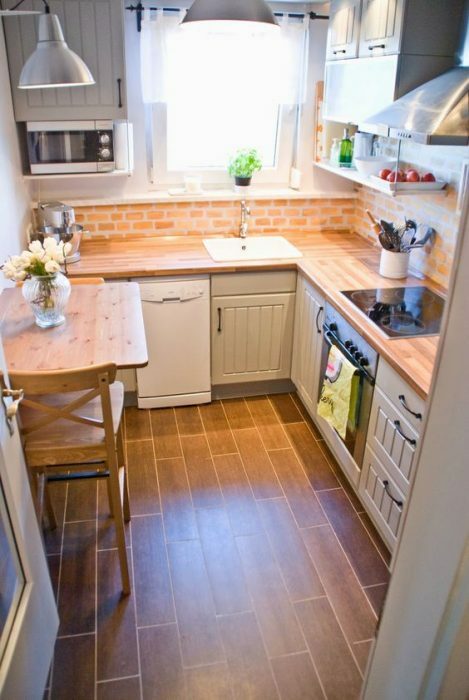 Here are small kitchen ideas, you can apply for your Small home. To create a small kitchen idea that brings you closer to the nature is quite simple. 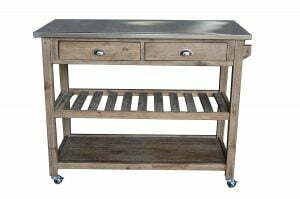 You can pick up natural materials to be applied in your kitchen. 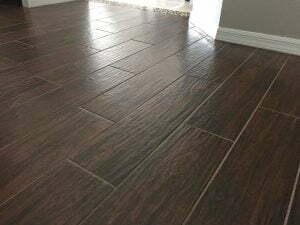 As starting, wooden floor will look perfect for the room. 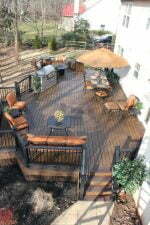 Instead of using large dining table, a small breakfast noon made of wooden with its natural color is perfect choice. Pick up natural color such as white and grey for the counters to strengthen the natural look of the room and make it looks larger. 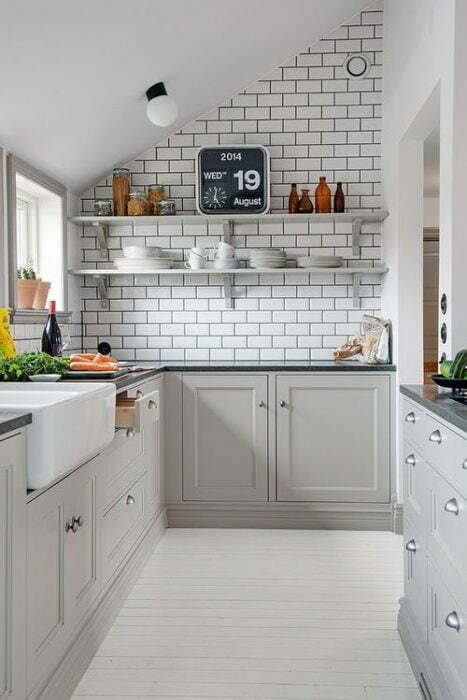 In this kitchen idea, white and grey colors dominate the whole look of the room. The two colors often become people’s choice when they want to decorate room with small space. The white painted walls and kitchen cabinets can blend perfectly with the grey floor. A rug with the same color makes the room looks warmer. A small breakfast nook that is only compatible with just one or two seats is not a best choice if you have children at home. Thus, a minimalist kitchen minibar is one of the perfect small kitchen ideas you can apply. White ceramic minibar combined with wooden element painted in dark blue creates perfect harmony to the room. It is such a great way to mix between modernity and natural. Pendant lightings that come with black color makes the kitchen looks really elegant. One of the best ways to create illusion that your small kitchen is larger than its actual size is by applying monochrome color to the room. 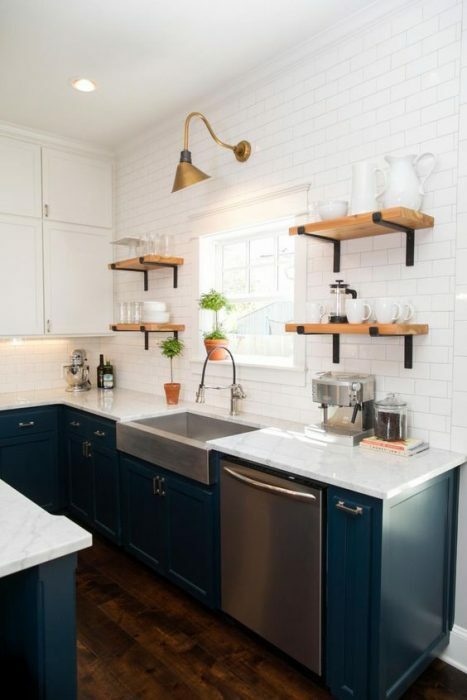 Instead of applying the same color for the top part of your kitchen counter, you can pick up wooden materials with their natural look to bring more colors to the room. With the sink is placed in the center of the room’s “letter U” design will help you create more space to move in the rooms. Bricked wall detailed doesn’t always bring your kitchen back to 70’s. 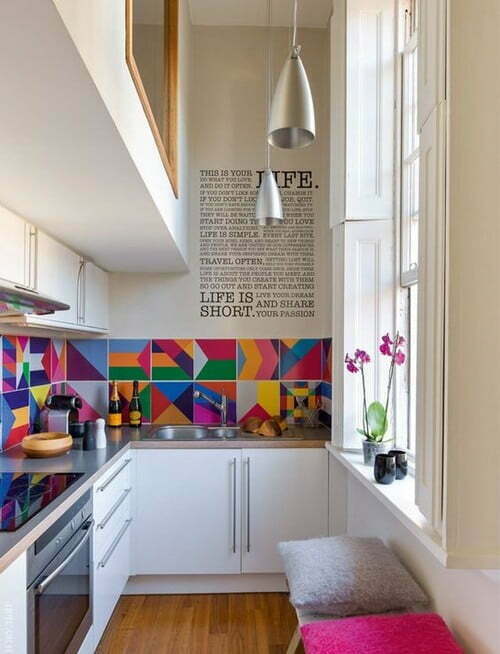 The chosen of wall feature makes the kitchen looks so fabulous. The white ceramic combined with wooden counters make the overall look of the kitchen not only natural but also modern at the same time. The wall light applied in the room is wonderful and will catch everyone’s eye. 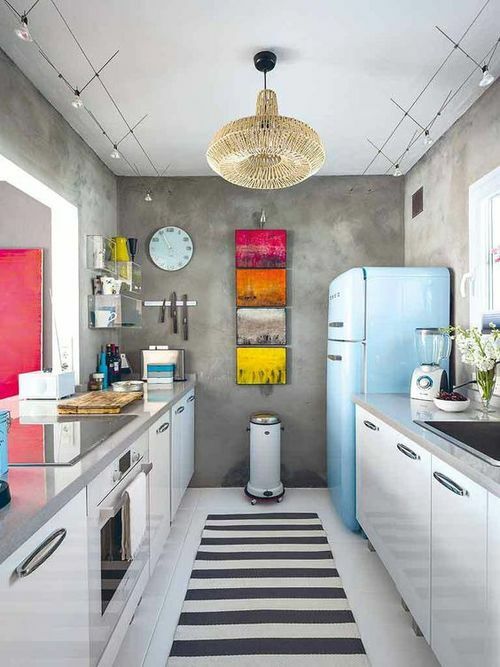 The center of attraction in this kitchen with small space is monochrome floor and artistic pendant lightings. 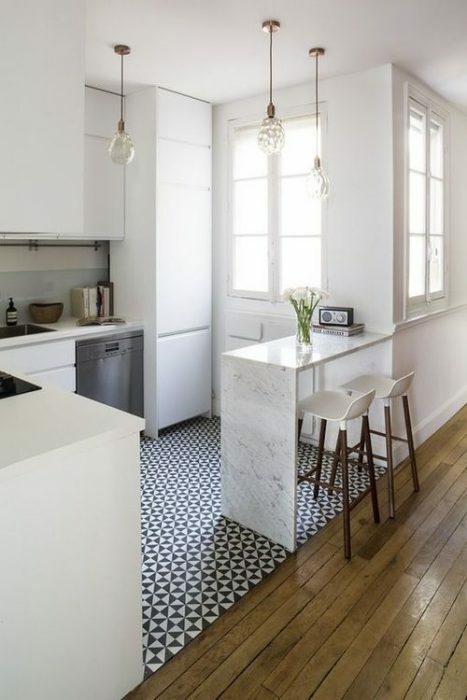 The floor that comes with monochrome floor and unique pattern brings more color to the room which is dominated by white color. 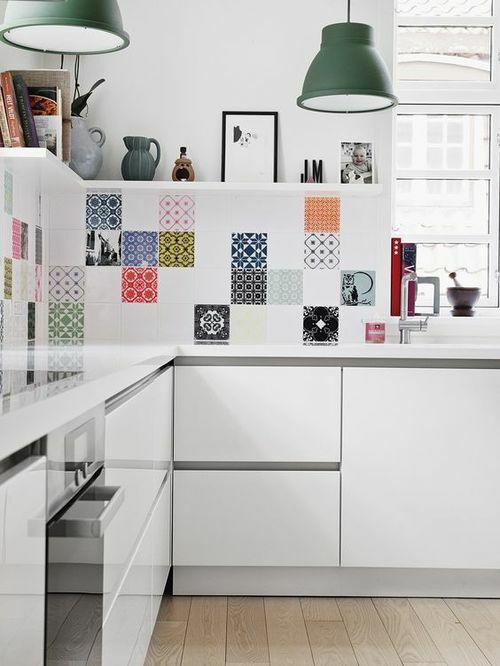 Contemporary design can also be perfect for kitchen with small space. Instead of letting the wall empty you can put beautiful word art to decorate it. You can cheer up the atmosphere of the room by applying colorful paint with unique patterns. Two little pillows placed on the bench just under the window can be a perfect place while you can spend breakfast time with your favorite book in the morning. 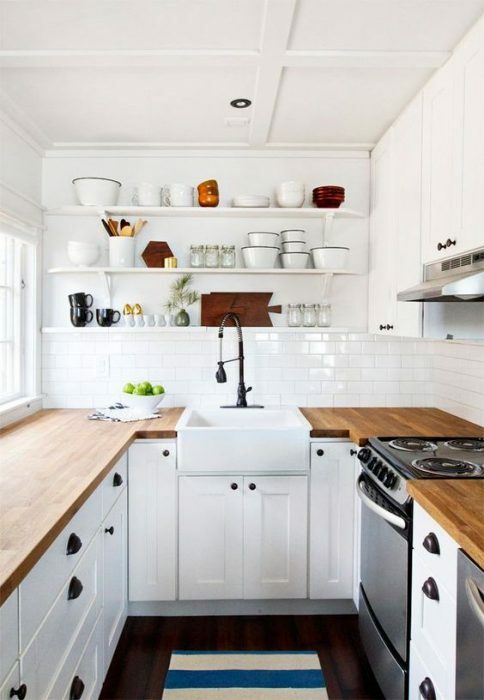 There is no better design for kitchen with small space than minimalist design dominated with white color. 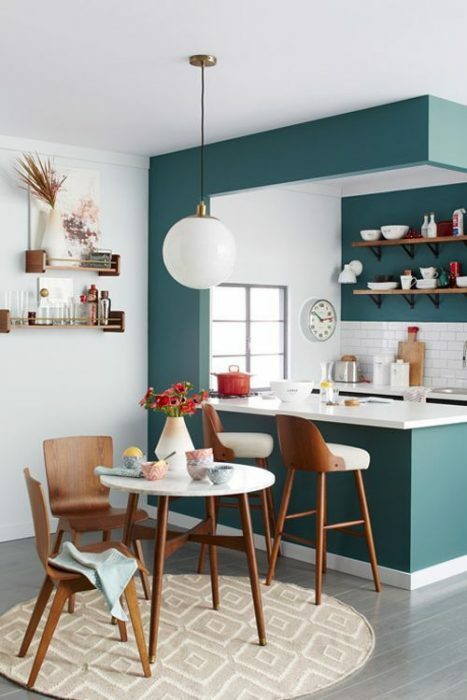 The paint can successfully make your kitchen room looks more spacious than it should be. The green maroon used to paint the wall brings warmer ambience to the room. Meanwhile, the pendant lighting with large circle bulb adds more accent to the minimalist kitchen. Never limit the expression of your art passion. Even, in the room your art touch should not be left. The traditional and artistic pendant light made of bamboo as well as light blue refrigerator add more accent to the room. Left the wall keep natural without any color paint is also a good idea. 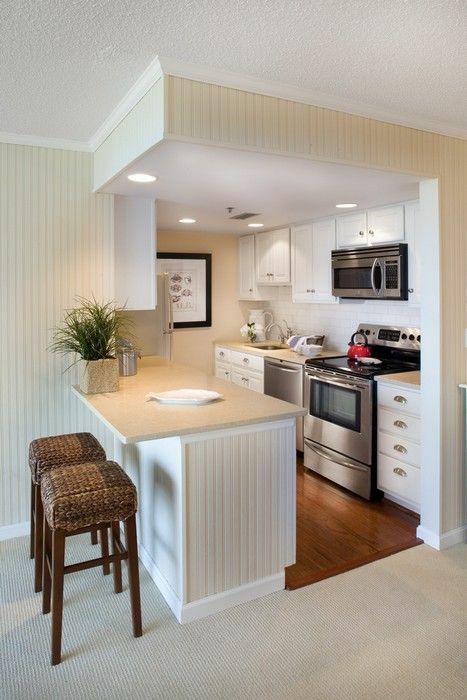 Again, white is perfect choice for small kitchen to help it looks more spacious. 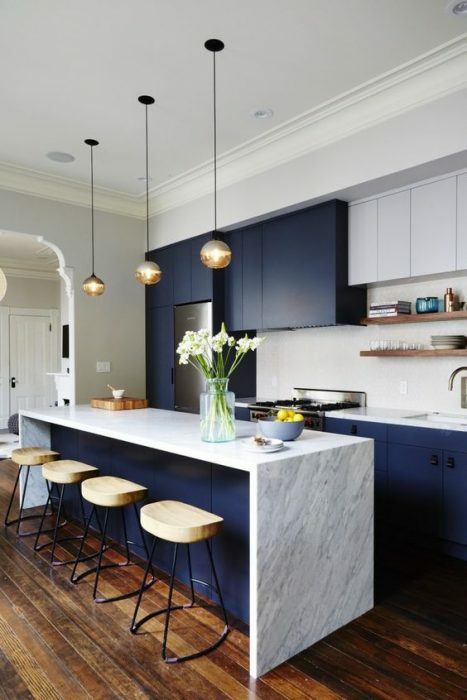 The blue floor and black pendant light used in the kitchen give the room more accent to avoid boredom. Meanwhile, the oriental rug can add artistic value to the room. One of items that makes the kitchen looks gorgeous is the recessed lightings applied for the room. Instead of using single color, the combination of white and peach color is perfect and makes the room feels warmer. 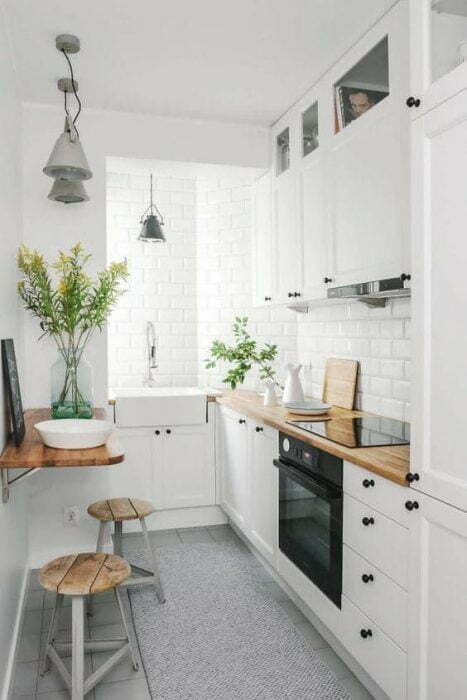 This is another idea of small space kitchen with black and white combination. The floor which is designed like a giant chest can cheer up the room. The unique pattern used in colorful curtain is absolutely perfect. 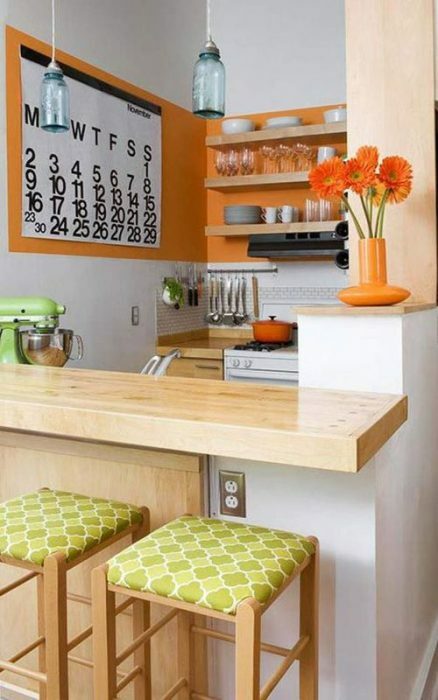 To avoid boredom and create warmness into kitchen room, you can try the combination of white and orange color. Dominated with white color with little part of orange added to the wall makes the room looks fresh. The green color used for the chair makes the room fresher. Who says that gray and white make kitchen room is boring? 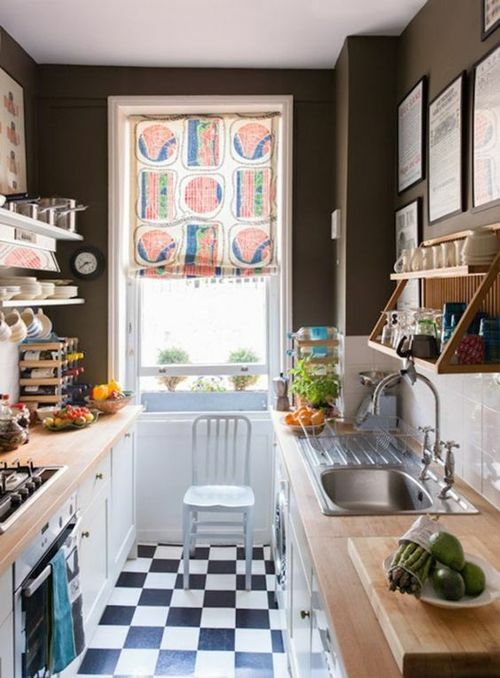 The two color can create perfect harmony for your small kitchen. 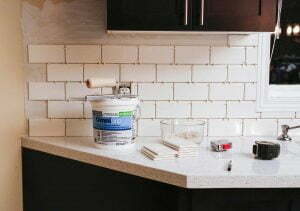 To give more accent, you can apply brick pattern to little part of the wall.